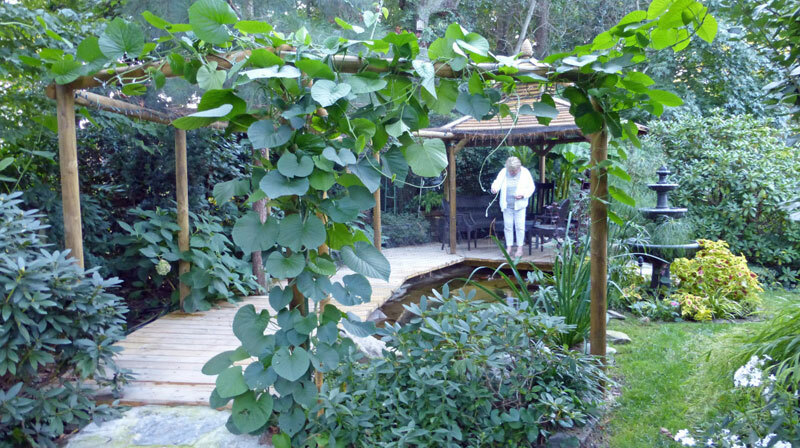 Mill Pond Garden, an eco-horticultural garden, collects mostly native plants that inspire and educate in natural style, are hardy for coastal, southern Zone 7, are easy to maintain, and are ecologically beneficial to the native web of life. MPG’s overriding goal is to copy nature so that the garden possesses an enhanced natural look: curved bed edges and walks, a mix of water features, stone, plants, intimate spaces and vistas, natural looking structures. MPG will maintain a planting mix of approximately sixty percent evergreen plants and forty percent deciduous plants to insure year round enjoyment as a “walking garden”, after the practices of historic Japanese gardens, and English romantic gardens. The large trees shall always be the prime productive native trees for the region’s moths, butterflies, caterpillars and birds, specifically Oak, Willows, and Black Cherries, with also mostly native ornamental understory trees. MPG will display plants that are low maintenance, highly resistant to disease, relatively low in pruning requirements and little or no pesticide spraying requirements. MPG will maintain a design and planting style that reduces weeding and mulching, principally by planting dense ground covers in beds densely planted with perennials, shrubs and trees, in imitation of nature. MPG will practice Integrated Pest Management for its plants. MPG lists its plants in an EXCEL document alphabetically by scientific name, in useful groupings as Bulbs, Groundcovers, Trees, Shrubs, Perennials, Vines, Ferns, “Walk-On-Me”s, and Favorite Annuals, with notes on source, size, special requirements, flower color and time of flowering, and other useful information. MPG will label each significant plant or group of plants with scientific name and cultivar name if there is one. Some plants, because of tininess or inaccessibility, may not be labeled. Labels will be of treated wood stakes to be as harmonious as possible. MPG will update all labels and records completely annually, but mostly as plants are removed or new plants acquired. MPG will select plants to be introduced, seedling or species variations, that may be beneficial to all plant lovers, collectors and gardeners, especially for qualities like new size, habit, or color, extraordinary hardiness, and notably better disease resistance. Plants which are candidates for being selected and named for cultivar introduction shall be trialed for at least three years.